After using this electric grill for about a month now, I can give you an educated review on the T-fal GC702. I’ve put it through the paces including grilling steaks, chicken, kebabs, and garlic bread on it. So far it’s held up very well! 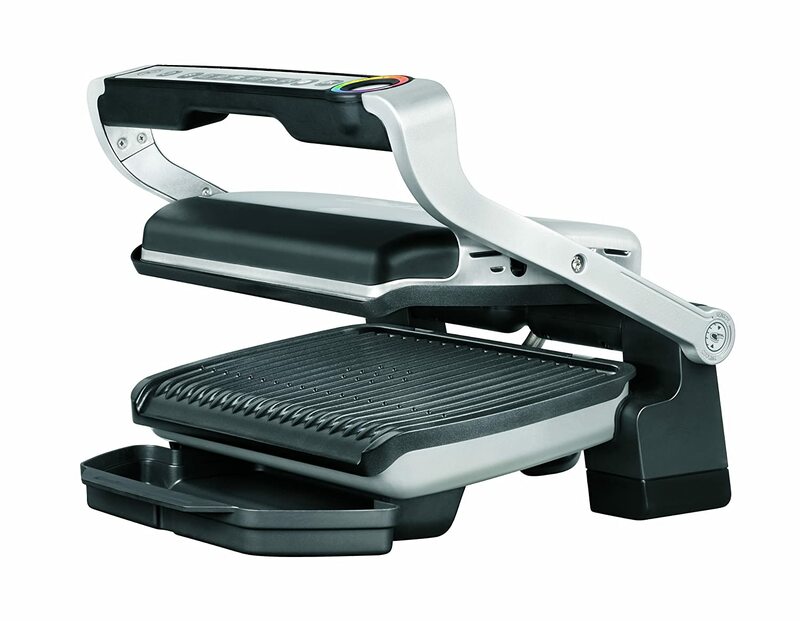 Check the most recent price on the T-fal Optigrill here with free shipping. I love using this grill. I’ve been using it on a daily basis for about a month now and it has handled everything that I’ve thrown at it. I also love that it has so many advanced features that make grilling indoors easier like adaptive temperature settings and smart heat up. It’s also a dream to clean since I can remove the grill plate after it’s cooled down and put it in the dishwasher. Done! The non-stick grilling surface is also really high quality. I barely had to use any oil at all which is a healthy benefit. Honestly, this is one of the best indoor grills that I’ve used. It’s also the first one from T-fal that I’ve had experience with. 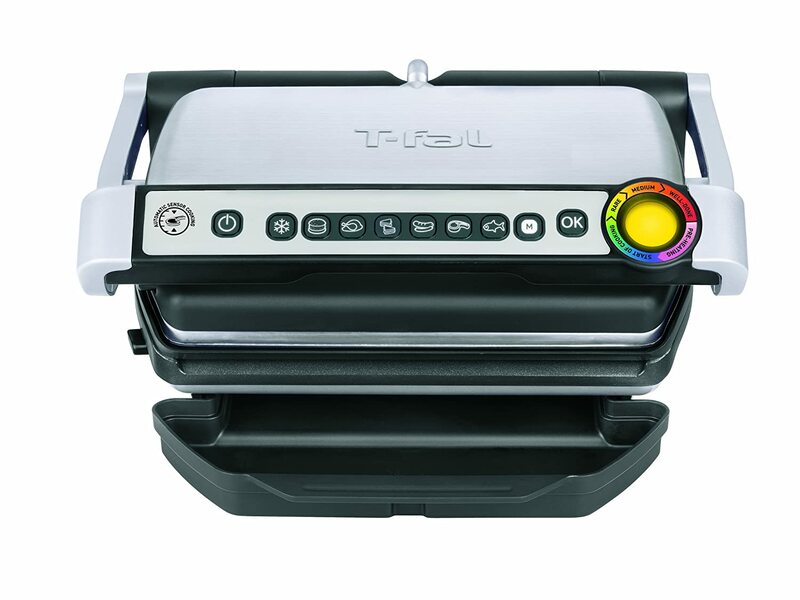 It is built solidly and I’ve had zero quality issues so far while using this excellent T-fal indoor grill. For me, I did find some of the features a little bit annoying. For instance, the doneness scale and settings on this grill didn’t exactly fit my definition of “medium” as I had a couple of steaks on the GC702 Optigrill just last week and they turned out more well done than medium. It’s a small annoyance but it may have been influenced by the fact that I just took the steaks out of the fridge and slapped them on the grill rather than waiting until they came to room temperature like I should have. This is a great video about the many features of the T-fal Optigrill electric indoor grill. Just make sure you don’t make the same mistake the guy in the video did and put the steak back on the same plate he too it off of! The video below will show you some of the cool features that this indoor grill comes with and will give you an idea of the quality that comes with the pricetag. This is one of the best electric indoor grills that I’ve used in over 2 years of indoor grilling. The combination of features, price, quality and performance make this almost a perfect grill. I would recommend the T-fal GC702 Optigrill to anyone that wants great grilling power and some really cool high-tech features like auto temperature control, doneness scale and easy cleaning. The T-fal Optigrill is a winner folks.